I’m looking at this in January 2019 and I’m just stunned – I had no idea that quilts could look like these ?. Just wow! Had a great time at the ScanNCut booth! Loved meeting so many people! Sew much fun at the Quilt Fest! Can you imagine judging these? How on earth do they decide? Amazing quilts, colors, designs and the quilting itself! They’re all so beautiful and different. WOW I wish I liked to quilt. So many beautiful ones there! Thanks for doing this. I have a bum knee and could not go this year. I have the Kai seam remover and it is awesome. Doesn’t rip fabric. Hi Angela. On the way there!! Super excited!! 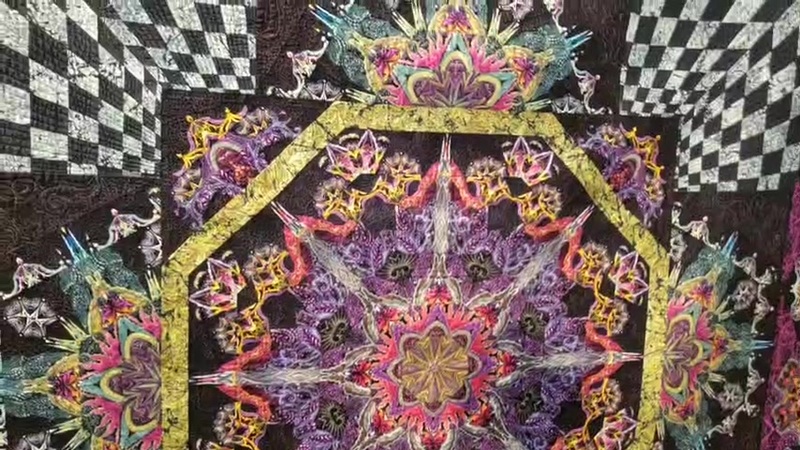 Am a quilter but have never done that detailed work. Love Jennie Doan for her Utube’s get them done quietly. Hope you have your step counter. Quilt Fest is so fun. I missed your live today – I almost ran you over when you were filming by the AllBrands booth (sorry about that)…..awesome show and love the energy. Wish I could have listened – needed to get back to help out at the quilting on leather booth. I’ll get back to garment stitching when I get home next week…. I’m so sorry I missed seeing you! I wonder if that one is thread painting. At first look, it made me think of candy. It’s gorgeous! It looks like crewel embroidery. I have not seen this type of embroidery in a long time. Of course I love the purple! I need one of Joes seam remover! You like pink and everything I have is purple! They look like famous paintings! Sorry I couldn’t see it live! I’m getting a seam mover!!! Hello, wish I was there. How in the world do they choose a 1st Place??? Could not do it!! Man oh Man! I could only dream of doing anything like these!!! Alice falling down the rabbit hole! Embroidery It was inevitable you would be recognized!!!! Be careful you don’t melt the edges of your plastic card with all the use!